Carmel's Corner: Let them learn! Ah the angst! You present, you want people to learn what you have to offer but are you really ready to let them learn in the way that best suits them? You are thrilled to be acknowledged as an expert in your area but worried that someone may steal your ideas. When you present whether to a conference, a meeting or in any circumstance, you are sharing the ideas and the knowledge you have so that others may benefit by learning from you. Why are you afraid if someone takes photos of your slides? It's the detail and the expertise you have to offer they will benefit from, not your pretty pictures. Oh no! there's no inspiring images, it is all text and screen dumps - ah, that was how the teacher did it back in school all those years ago. Text heavy presentations invite photography. How else will the learner get to note down all those points you've decided are so important they must be listed? Remember the scramble to copy everything from the blackboard (whiteboard) before the end of class back in school or university days. Have you provided a place where the audience can retrieve the links you've provided? How will they remember the long name of that fabulous site or organisation you just mentioned, - snap, a quick photo will do it. Is it really a surprise that the person who has paid to attend your presentation needs more than the memory of your words to take away, to revisit and learn? If they are busy trying to copy everything from your slides, are they getting the best from your talk? How do you learn best? Are you a visual learner? Does audio suit you better? Have you supplied the attendee with online notes/slides so they can concentrate on your message? Have you given them notes at the beginning of the presentation? Will the presentation that they have paid for, be accessible? If not - expect participants to take photos, expect folks to use every means at their disposal to capture the information being presented. Why not share? It is sure to generate more interest and if your presentation was sooo.... good, of course you'll do it again and again, and by the next time you'll have new up-to-date information to add - the slides will be outdated or at least outmoded. Get your Creative Commons licence here Explain it to your audience too so they understand their rights and responsibilities. Display a QR code that leads to your slides right at the beginning of your presentation and allow time for participants to scan it. Now they will have your slides on their phone or tablet and need not interrupt you or their neighbours by trying to get a shot of every slide. the information you have to share will be outdated - let people make good use of it now. Check up on what you agreed to do. The audience are clients, are you not bound to provide them with best learning experience possible? I've written this post in response to so many negative things written about participants by some presenters after RootsTech, a large genealogy conference in the USA. No, I did not attend - out of my budget range, but I learn so much from the caring souls who share their content online. It seems many conference participants were using their phones to photograph slides - it may be that some presenters had not given their audience a variety of other options to access the content. My genimate Jill has also addressed this issue which has prompted me to revisit this post. I respect copyright and acknowledge sources but thank the YouTubers, the slidesharers, the Facebookers, the edTechers (yes often teachers) bloggers, webinaries, screencasters, geniesharers and too many more to mention. I've learnt and continue to learn from your visuals, audio and text. All content, your presentations and mine are built on previous knowledge. Where did we get that from? We read, we learnt, we watched, we absorbed, we processed, we were inspired and sometimes we came up with an original idea. Our knowledge is built on the foundations provided by others. We adapt, add to and remix just as suggested in the creative commons licences. Help others learn with your visuals and text. 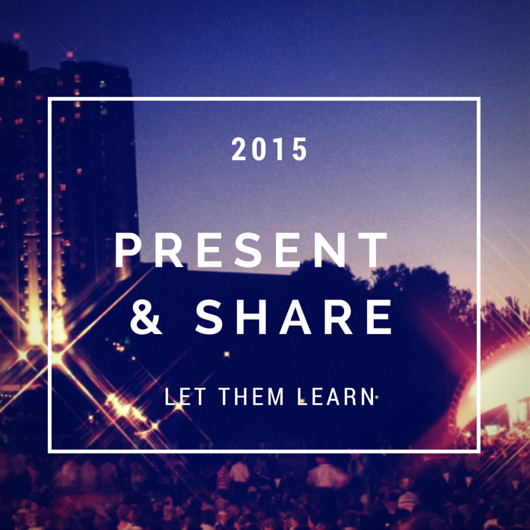 Slideshare, Dropbox, Box, Google docs and slides, YouTube, blogs and more. There are dozens of ways you can share your content online. Excellent examples of sharing using both paid and freemium models are Thomas MacEntee, Richard Byrne and Lisa Louise Cooke to name but a few. What are you waiting for? Times have changed! Library Currants by Carmel Galvin is licensed under a Creative Commons Attribution-NonCommercial-ShareAlike 4.0 International License. You have put your points so eloquently. I concur with all you say. You'll definitely be top of my GeniAus' Gems list this week. Another thing I have done recently is that I have taken down some old presentations that have become outdated and,in the light of new developments, I didn't want people to use old material. Good idea, I must do that too and I've just noticed I need to edit my Also On... links! I do provide extensive handouts for all my talks which include all links and key information. I also use a lot of documents and images in my presentations that I have requested and received specific permission to use in the presentation.This is why I have requested people to not take photos of the slides. Also I have been finding that people are becoming so concerned with taking the photos they aren't listening to the presentation and have even stood up to take a better picture which is very disruptive to people around them. What is being forgotten in the conversation around Rootstech/FGS is that the 'no photography' was a directive of the conference and handouts were available to all participants long before the conference. Carmel, I thought I'd commented yesterday but mustn't have sent through. I am ambivalent about aspects of this though you have certainly raised some thought-provoking issues around the educational aspects. One issue may be that the US has a bigger, more competitive market place for speakers. I've been to a range of conferences from Congress, professional, academic and general interest. I have never felt a lack when there's no handouts before and in fact can find them quite distracting. My own note taking works for me but that may the experience of uni lectures and as you say people learn differently. nowhere else have I seen people taking snaps all the time through the talk as happened at RT with or without permission. I asked in a couple of cases specifically for use in my blog but didn't end up using them. I use Evernote to record my notes, or a notebook if I want more graphic I concepts illustrated. What I take from a speaker is not so much the "how to" but the "ah, I could do this with that info." In the talks I've done, I've added them to my blog as has Shauna. Even one I did last year that I ended up unhappy with...too dense, too much data. Helen makes a valid point about having to get permission to use images (which can deter including specific ones in talks). Photographing the, from the floor runs counter to that permission. I do think there's an attitude of entitlement a lit with genealogy -not from everyone, or the majority- but this cuts across courtesy, ethics and the author's IP. That is indeed the crux of the matter. It would be interesting to know how academic conferences approach this issue in 2015 since, in theory at least, they are the bastions of both education and intellectual property. A final point...it should be remembered that each presenter at a conference, certainly at Congress, provides a written article relating to their talk and this forms the basis of the actual presentation which the attendee and listener can refer to and add to their learning. Yes, my post was intended to promote thinking and discussion around the issue and I do like your referral to courtesy, ethics and IP as being the crux of the matter. I raised the issue of Creative Commons as such a licence allows the author to clearly stipulate in what or no circumstances that material may be used. I have certainly uploaded presentation slides and documents that vary from those used live and explained to audiences why what they may see will vary according to copyright permissions. Yesterday I attended a 'how to' presentation and both the range of sites and the searching hints and tips that were explained were provided at the beginning on paper. Both the intellectual content and the nature of the presentation guide what is included. A story telling presentation certainly would not need this amount of detail. In yesterday's case I observed the audience of about 35 scrabbling to get down all the salient points which had in fact been provided for them on paper. The handouts have a clear copyright statement on them but they will be more useful for me in digital format. Hence I have scanned and saved to my Evernote for personal use only. In an academic situation I would hope that the lecturer, teacher etc would be available for further clarification and/or consultation. Many presenters are generous in this manner too. The capacity of a conference participant to absorb all material presented in such a concentrated time period is probably one of the biggest obstacles to effective learning. The desperation factor of 'getting value' for significant financial outlay should not be discounted. Perhaps this contributes to the attitude of entitlement.This is of course no excuse for poor behaviour. AFFHO Congress 2015 Yes, I have the abstracts saved to Evernote so hope to do very little notetaking but lots of listening and learning. There is also the option of buying the complete proceedings available on usb for $20. Thanks for contributing to the discussion.